I need to generate a pdf that's mirrored. 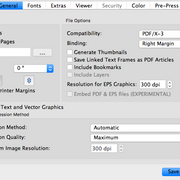 I found the options to mirror output (horizontally or vertically) in the export PDF options. I have tried every combo of options that I can think of. But no matter what I do the output stays the same (NOT mirrored). Is there something I need to know to use this feature? Is this feature working? My google-fu is sometimes lacking, but I've searched and searched and really don't find any information at all about this option to mirror the output. I can't be the only person who needs this feature, or can I? Please forgive me if this has been covered before, as I said my searches haven't turned up any info—but I'm new to this world of layout, impositing, and printing so I might be missing something key. ... just click on the horizontally mirroring next to it and you should have the result you're looking for. i gave a try with the latest 1.5.x code and it seems to work as epxected. Yeah I tried "horizontal mirroring" and "vertical mirroring". Neither option had any effect on the output. No mirroring happened for me for either option. I prefer to use 1.4.7 since it's labeled stable and that's what I have installed. (Should have mentioned). Unless I hear another answer for 1.4.7 I will try it under 1.5.x. Can i install the lastest 1.5 code under 1.4.7 on MacOS without them corrupting or interfering with each other? Not matter what I do the mirror vertically, and mirror horizontally, fail to have any effect on the output. Is there some other conditions that have to be met for this to work (other options)? Regarding google-fu, i suggest that you learn the advanced search methods in google. And this feature is new to me also. Always learning. We'll, it's all graphics. So it will be difficult to send it without graphics. But here's a new clue. I created a new Scribus file with text frames to send you. Generated the new pdf ... it mirrored the text frames exactly as I'd expect. Added a layer to my original document. Added text frames to that layer. Generated the pdf. The mirroring options have no effect. So the problem might be with the document (or I'm missing some fine point). Thoughts on what to do next ? collect your document for output, open the collected file, make sure that you still see the issue in the collected file, delete all pages but one or two, make sure that you still see the issue, collect again for output in a new directory, check that you get the issue also there, zip the directory, send it to me so that i can test it. for sending: upload it somewhere and then publish the link in this forum or send it to me as a private message. Just a long shot: Sare you sure you are not viewing the old PDF? Easiets way is of course to simply delete the old PDF before trying mirroring.